A Japanese government spokesman defended an annual dolphin hunt today after US Ambassador Caroline Kennedy tweeted that she was deeply concerned by the inhumanity of the practice. Chief Cabinet Secretary Yoshihide Suga told a news conference that dolphin fishing in Japan is carried out appropriately in accordance with the law. “Dolphin fishing is a form of traditional fishing in our country,” he said, responding to a question about Kennedy’s criticism. She added that the US government opposes such fishing. Drive hunt refers to the practice of herding the dolphins into a cove, where they are trapped and later killed. The hunt in the fishing village of Taiji in western Japan has come under international criticism and was the subject of the Academy Award-winning 2009 film “The Cove”. The fishermen in Taiji say the hunt is part of their village tradition and call foreign critics who eat other kinds of meat hypocritical. Email “Annual Japanese dolphin hunt documented in 'The Cove' begins amid US criticism ”. 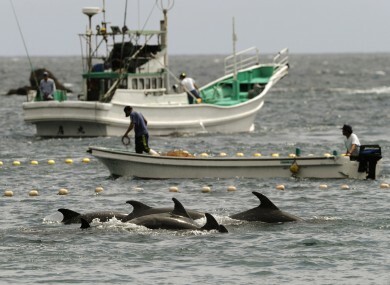 Feedback on “Annual Japanese dolphin hunt documented in 'The Cove' begins amid US criticism ”.